Music – an integral part of our lives, it accompanies us everywhere, so it is important to ensure its quality and sound. The sound quality of your speakers can be affected by the room features and interior items, which may cause resonance at certain frequencies. Moreover, reflected sound waves can distort the sound, and in small rooms and low frequencies may disappear altogether. That is why it is important to correctly and properly hang acoustics. 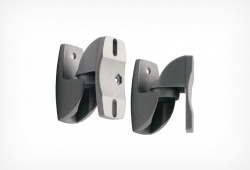 Holder solves this problem and our brackets help you to hang up your loudspeakers in right place. Nothing should prevent you from enjoying your favorite music, so we have developed mounts for speakers of different sizes. Owners of the mini-systems will appreciate model’s LSS-6001 features, tilt and swivel options. 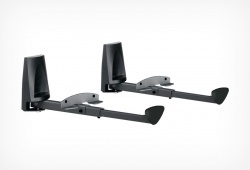 For acoustics of medium and large size the ideal mounts is LSS-6002, equipped with leg length adjustment up to310 mm. The design of these models will not leave you indifferent: Stylish plastic overlay makes the usual bracket unique detail of the interior. We want you to spend your vacation accompanied by good music.